You will come to a high rise bridge, the Washington Baum Bridge. Across the sound to your right you will see lots of boats and condos. This is Pirate’s Cove Yacht Club. After crossing the bridge, there will be a traffic light (approximately 500 yds after crossing). Get in left lane. At this light, take a left. It will put you on a feeder road under the high rise to the public boat ramp. 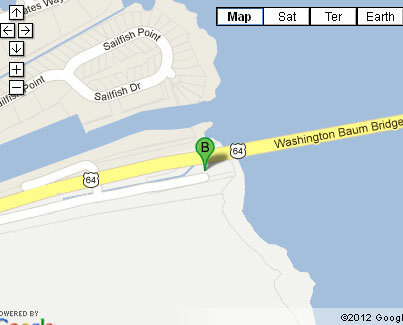 Look for a blue sign at the light on your left that will read: Washington Baum Public Boat Ramp. The boat and Capt. will be in the water waiting for you. You will find plenty of parking along with clean restrooms for your use at the park.